A source tells E! News that in the months leading up to Tuesday night's candid announcement, the pair's relationship was "up and down." "They had really low moments in their relationship this past year and then would make up and have really high points that kept them from completely splitting," the insider explains. 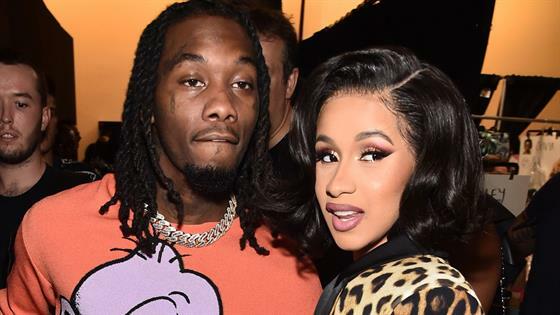 More recently, "rumors" about their year-long marriage made Cardi question "Offset's loyalty, which really pushed Cardi over the edge." This lead the couple to start "fighting a lot." While they were able to work through obstacles in the past, the insider says this time around the "I Like It" rapper "couldn't get through this rough patch." "Cardi will always love Offset, but ultimately lost trust in their relationship." The source close to the couple adds that the new mother has "made it clear she needs space from him." Understandably, the insider says, "Cardi is upset," especially since she "would love to keep the family together, but knows this is what is best right now." It was nearly six months ago when the famous pair welcomed their daughter Kulture Kiari Cephus into the world. Nonetheless, the source says Cardi believes the Migos rapper is "an amazing dad and business partner." Cardi said it herself when she revealed they were splitting on Instagram. The "Bodak Yellow" rapper told her thousands of followers, "He's always somebody that I run to to talk to and we got a lot of love for each other but things just haven't been working out between us for a long time and it's nobody's fault." Although, if you asked Offset, he would probably blame the media. After Cardi shared the disheartening video, Offset commented, "Y'all won."